New: MCA Scrapbook now available on the Internet! Welcome to the Mustang Club of America's official archives of Mustang Times, the monthly magazine of MCA. The policy of the Mustang Club of America is to have a 12 month delay for providing images of Mustang Times. The indices, however, are complete and up-to-date. As time progresses, Mustang Times with more than a year's age will be uploaded to the internet for your use. Randy Jacobson graciously scanned and indexed all of the Mustang Times from 1977 through 2011. Special acknowledgements go to Charles Hampton for his generous loan of Mustang Times, Carl Eckhart and Stefan Magnusson, for their generous donations of his collection of Mustang Times, to Joe and Bob Pajak, Rex Turner, Leonard Goff, Marshall Reed, Jr., Preston Whitacre, Ed Saitz, Mick Wolk, Tom Taylor, James Gorman, Gary Schweitzer, Mark Marcus (and the First Tennessee Regional Group), John Dwyer, Paul Steidel, Mark Otis, and Tina Easterwood for their donations of Mustang Times, and to Michael Ward for his help in scanning various issues. A list of missing issues is found here. Anyone interested in loaning or donating their issues should contact the Historian of the Mustang Club of America at mustang@mustang.org. Similarly, missing pages of Mustang Times may be scanned by the owner and sent to the same e-mail address. To access the Mustang Times images, it is suggested that one first access one of the three database volume listings. These three database volume listings are available for each of Volumes 1-10, 11-20, 21-30, and 31-35 The databases include: one only of articles, one only of advertisements, and the last consisting of both articles and advertisements. Because of filesize/bandwidth limitations, there are no files containing all pages of an individual Mustang Times issue. The databases are in PDF format, readable by Adobe Acrobat, and contain bookmarks to each volume/issue. Clicking on an individual bookmark will move the screen to the appropriate volume/issue. These database files are easily searchible within Acrobat by using the "Find" feature. Links to the appropriate file are found within the database itself, and clicking on the link should bring up the pdf file on your browser. At this time, Volumes 1-10 (1977-1986), Volumes 11-20 (1987-1996), Volumes 21-30 (1997-2006), and Volumes 31-35 (2007-2011) are available. Naming conventions: file naming conventions are fairly straightforward. Most of the Mustang Times have page 1 being the cover page, but some issues begin page 1 with the first non-cover page. The front cover is cover.pdf, and if the back cover is also a picture of a Mustang, it is combined with cover.pdf. If the back cover is a ad, the filename is cover4.pdf. The inside front cover is named pg2.pdf (or cover2.pdf); the inside back cover is called cover3.pdf. 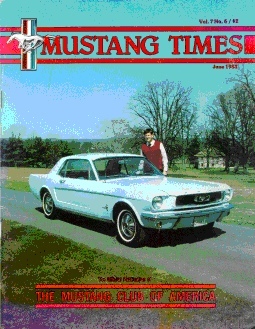 Many Mustang Times came with a paper outer cover; the front combined with the back is named coveri.pdf; the inside front cover is named coverii.pdf; and the back inside cover is coveriii.pdf. Within the Mustang Times, file names begin with "pg", followed by the beginning page and if more than one page in length, followed by a dash and the last page in the sequence, all of which is followed by ".pdf". Some articles and many advertisements are only part of the file; check the actual page number of the article/advertisement in question relative to the file name. Miscellaneous Information in the Archives MCA published membership lists in 1978 through 1983, containing names, addresses, phone numbers, and MCA numbers. Due to privacy concerns, this information will not be placed on the internet. If anyone wishes to find information from these membership lists, such as recovering a previous MCA membership number, please contact the MCA office at mustang@mustang.org. Any errors in scanning and databasing are the responsibility of the Randy Jacobson. There are likely many errors that I was unable to check for, so I would be grateful for information relating to errors found by the readers. Any corrections should be sent to mustang@mustang.org, along with any comments, suggestions, or requests for information.